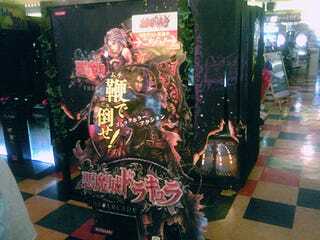 That's the cabinet for yet-unreleased Castlevania arcade title Akumajo Dracula THE ARCADE. Reader Landon got a hands-on with the game at a location test while strolling through Tokyo's Ikebukuro. What did Landon think? He totally dug the game, its gameplay, graphics, music — the whole schbang! Hit the jump for Landon's impressions. Don't forget to thank him and tip your waiter. Players enter the machine on either side. The inside was very spacious, much wider than some I've seen of a similar fashion. The bottom of the machine, in front of where each player stands, was lined with LED lit candles. Each player holds a controller shaped like the handle of a whip. The top of the whip handle is lit up with LEDs - 1P is blue, 2P is a dark pink. Each whip handle has a yellow trigger where your index finger goes. This controls your subweapon, such as knifes, crosses, etc. A red button is placed where your thumb goes. Sadly, I was not able to use it in this demo of the game, but the Konami rep told me it was used for activating items you get later on in the game. During gameplay, swinging the whip handle, a la Wii remote, results in a slash mark across the screen. When the game starts, each player is asked to stand in their designated spots and aim the top of their whip controller at the center of the screen and press the yellow trigger button to calibrate the motion sensor. The game begins in an outside area. Skeletons stumble onto the screen much like Silent Hill or House of the Dead. Some shoot arrows at you from a distance. You can take them out either by swinging your whip or by throwing knives at them (by pointing the tip of the whip controller and firing with the yellow trigger). Subweapons, such as knives, consume hearts. You can regain these by shooting various candles placed throughout the areas. There seemed to be a maximum of 25 hearts while I played. The first chapter ends after you arrive at the gates of Dracula's castle and fight Death, your first boss. I squealed a little bit when the Bloody Tears theme started playing during the fight. Chapter two took place inside the castle. The boss was a giant skeleton snake, and upon winning the battle, the demo ended. The graphics were really nice, definitely next gen; on par with PS3/Xbox 360. One small detail I liked was that any candle I whipped/threw a knife at would cause the surrounding area to go dark when destroyed. This game was a total blast. Nostalgic music, sweet graphics, whip-cracking action. There's nothing more I could've asked for in a Castlevania arcade game. I used to think Silent Hill was kinda fun when I was a little bored, but this totally blows it out of the water. Good job, Konami!